Relief is here for anyone suffering from arthritis in hands, rheumatoid arthritis, arthritic joint and muscular pain! Rich in Omega 3, Ocean Omegas Arthritis Oil aids in the relief of joint & muscular pain caused by osteoarthritis. 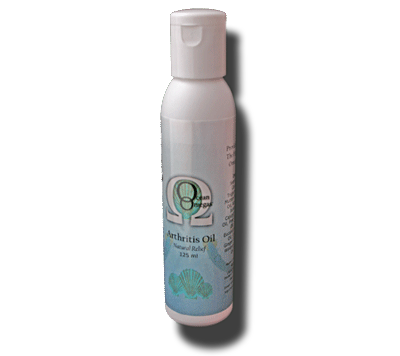 Ocean Omegas provides you with the highest quality Omega 3 & 9 oils in this amazing arthritis treatment. This is a natural treatment for arthritis. For more testimonials about this arthritis remedy, read the testimonials under the information menu above. Ingredients: Sweet Almond Oil, Caprylic-Capric Triglyceride, Olive Oil, Mutton Bird Oil, Avocado Oil, Alpha Tocopherol, Juniper Berry Oil, Cajuput Oil, Peppermint Oil, Pine Oil, Sweet Orange Oil, Tea Tree Oil, Eucalyptus Oil, Rosemary Oil, Lemongrass Oil, Ginger Oil, Marjoram Oil, Wintergreen Oil, Kunzea Oil, Fragrance.